Wikipedia says that Pozole is a traditional Mexican stew made from hominy that’s been cooked with meat and seasonings and topped with garnishes, drugs such as avocado, cabbage, radishes and lime juice. It’s like a hearty, Mexican corn chowder. I actually spotted a recipe on Elise’s site awhile ago and knew I had to make it for Tom. He has an unnatural attachment to Mexican cuisine. Since I always lose them, I never printed out the recipe, but saw some dried pozole at the market and decided to wing it. 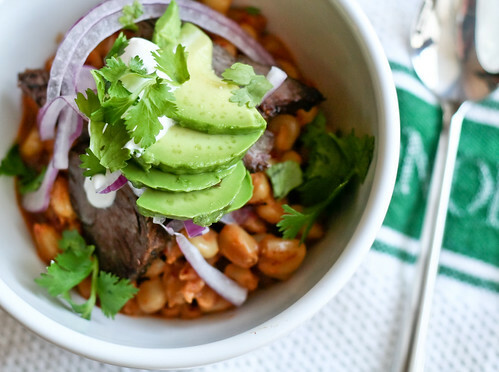 While you can use canned hominy, it has a much softer texture than the dried pozole kernels. You can get these online or at Hispanic markets, some grocery stores and Whole Foods. They’re like beans in that you have to soak them overnight, but their texture is much meatier and provides a nice chewiness to the dish. They soak overnight and then stewed with dried chile de arbol and ancho peppers, making a nice, spicy broth. Just add a bit of cream to thicken it up, then top with your favorite garnishes. I used what I had on hand — avocado, red onion, thinly sliced skirt steak (leftovers! ), sour cream, lime juice and cilantro. The garnishes are really the fun part. You can set them all up on the kitchen counter and have everyone assemble their own pozole the way they like it. It’s kind of like taco night with a spoon. And it was delicious with all of the different textures and flavor contrasts. I think someone will be begging me to make it again quite soon. The pozole needs to soak overnight and cook for 2 – 3 hours, so make sure you give yourself enough time. This is more of a Sunday supper than quick weeknight dinner. Soak the pozole overnight in a pot. 3 hours before you want to eat, drain the water from the pot, then add the chicken stock and dried peppers (whole) and bring to a simmer. Cover and let cook for 2 – 3 hours, stirring occasionally. When the pozole has softened, it’s ready to eat. You’re looking for a slightly chewy texture. The kernals should be soft, but not at all mushy. Pick out any large chile pieces or stems then stir in the cream and remove from heat. Place all of your garnishes on the table, ladle the pozole into deep bowls and let everyone pile on their own toppings to taste. ooh! I *heart* pozole. My friends made it for us a couple of times and then Annie attempted it herself. She used oxtails for broth instead of chicken stock. So yummy. I adore the use of avocado in this soup. Nate – OMG. Oxtails would be amazing! I have never had pozole or hominy but this looks really tasty. I will have to look for some. That looks nothing like the Posole I had in New Mexico. It looks really good. I never thought of pozole as a garnished stew–your version looks and sounds SO much tastier than those I have looked at before. I am putting this into the to try file…. My mother in law makes a version of this, so I gave her your recipe, and it was SOOOOOOOOOOOOOOO Good, thank you. Amanda – Thanks for reminding me about this one. I have a bag of pozole and some skirt steak. I forgot how much I love this dish! for a true pozole you should never drain the water you used to cook the hominy in, thats what gives pozole its unique flavor.